Monday is Memorial Day. 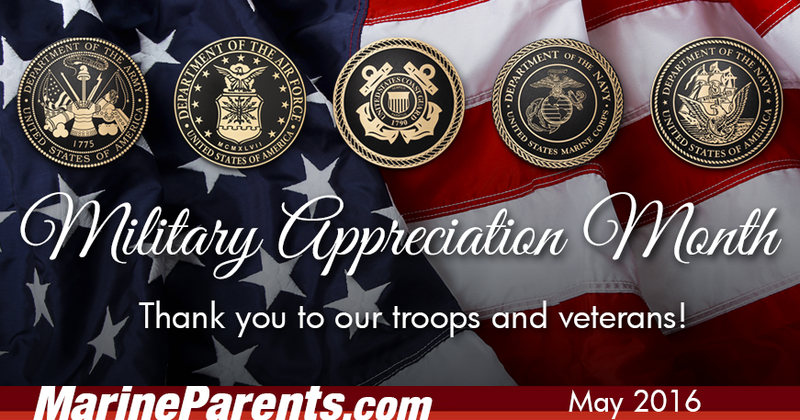 We encourage our readers to take a moment to reflect on the sacrifices the men and women who have served our country over the years have made, and continue to make, on a daily basis. 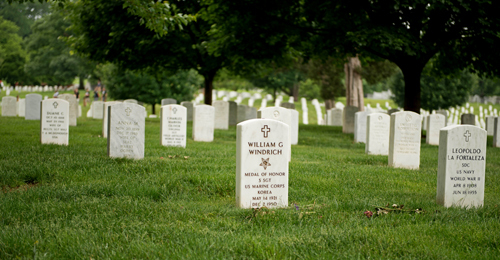 This coming Monday is Memorial Day--a day for reflection, remembrance, and the honoring of the men and women who have served our country over the years. This week's featured volunteer is a long-serving military supporter from Texas--Tiffney Tinney. Tiffney has been an Official Marine Parents Facebook Group volunteer since 2015. In August of 2015, Tiffney began serving as the Company Leader for India Company and, since November of 2015, has served as the Company Leader for the Medical Rehabilitation Platoon. 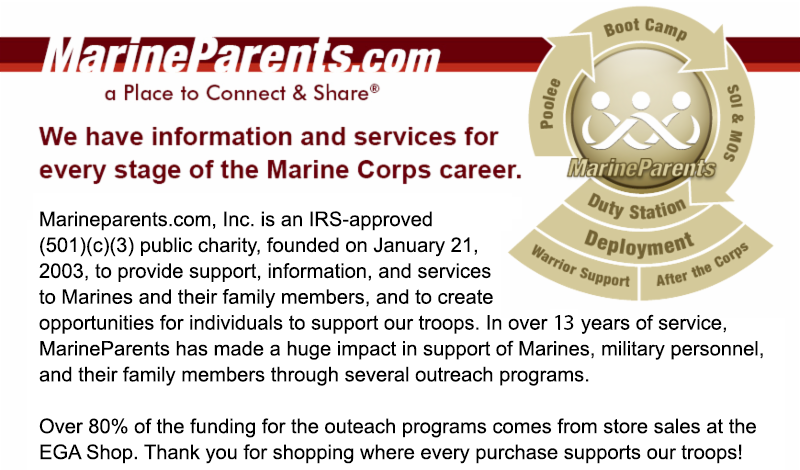 When Tiffney's son announced that he was joining the Marine Corps, she thought "yea right." Then, one day while Tiffney was at work, her son called her asking all sorts of "weird" questions. Tiffney asked her son why he was asking these questions, to which he replied, "I'm signing my paperwork for the Marines." *Image info: Tiffney Tinney and her Marine son. 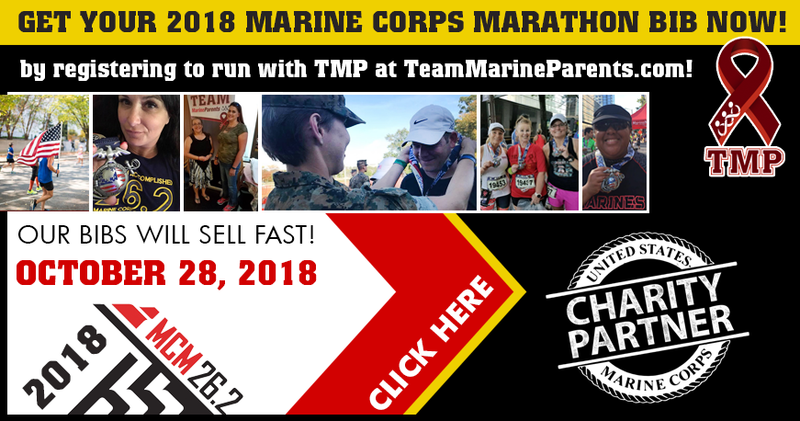 This week's TMP featured participant is a proud Marine aunt--Laura Schubert. Laura is a a 40 year old mother of two children who are both very active in sports. She has been married to her husband, Jay, for almost 16 years. Laura decided she wanted to complete a marathon this year to check it off her bucket list. Laura has done a couple of half marathons in the past but this will be her first full marathon. 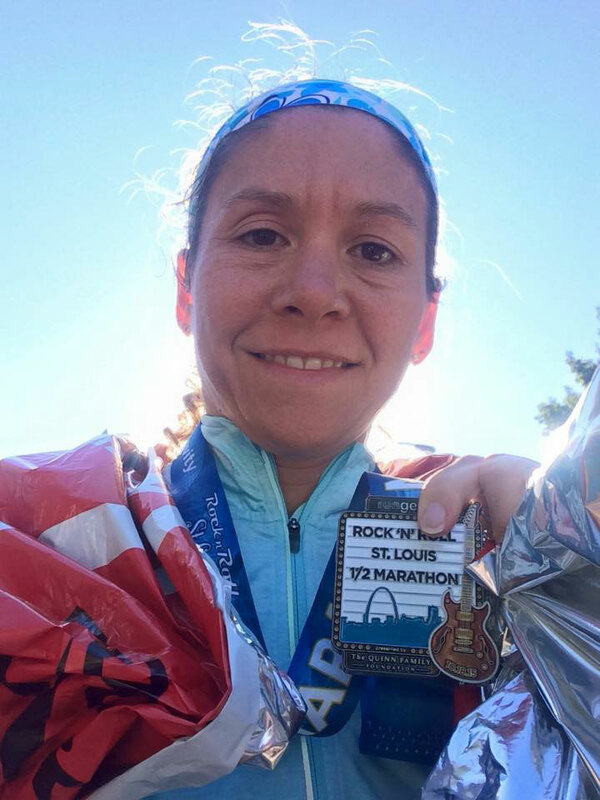 When her sister, Michelle Foster, told Laura she was going to run the 2016 Marine Corps Marathon, Laura decided to join Michelle in running the marathon. 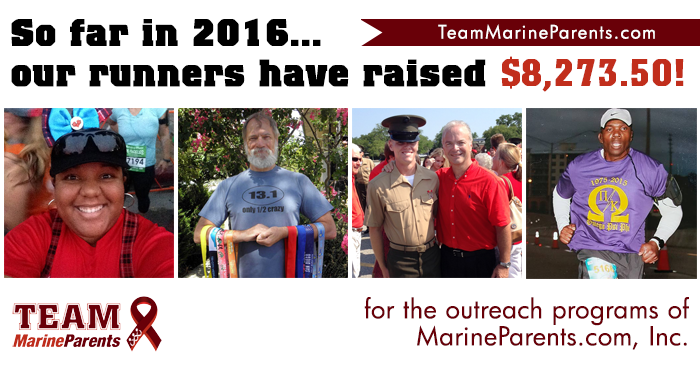 Together, the two women run as "Team Ethan" in honor of Laura's Marine nephew and Michelle's Marine son, Ethan. So far, Team Ethan is still working on reaching its $1,000 fundraising goal, and we know that with your generosity and support, these proud sisters can reach that goal in no time! Thank you, Laura, for being a part of the team and for all that you do on our behalf! Good luck in October! *Image info: TMP member Laura Schubert. Last Thursday, May 19, saw retired Staff Sergeant Charles Linville, of Boise, Idaho, a combat-injured Marine, become the first combat-veteran to reach the "top of the world" when the climbing party he was with summited Mount Everest. 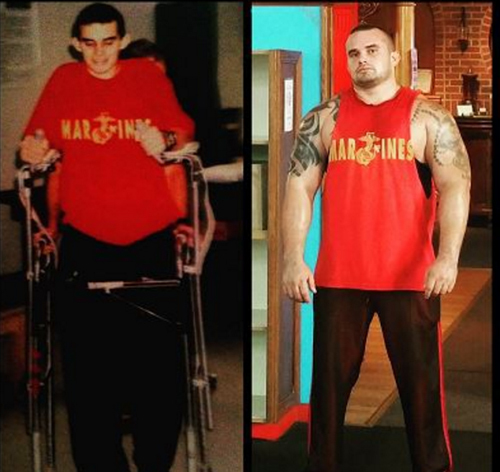 Linville, 30, was wounded in Afghanistan in 2011 when an IED he was diffusing exploded, causing his to sustain a traumatic brain injury, an amputated finger, and a severely injured foot. After more than a dozen unsuccessful surgeries, Linville decided to have his foot surgically amputated in 2013. The expedition to reach the top of the mountain was sponsored by The Heroes Project and was Linville's third attempt to summit Everest after the 2014 and 2015 expeditions were forced to turn back early after natural disasters. In completing the climb, Linville became the first combat-veteran the achieve " The Seven Summits" by reaching the highest peak on each of the seven continents. *Image info: Mt. 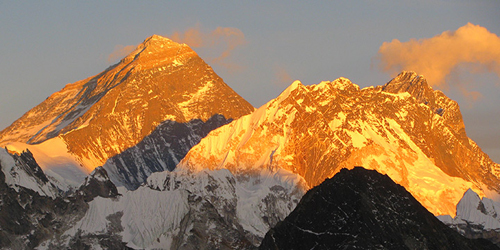 Everest is the tallest mountain in the world at more than 29,000 feet. An obstacle in the Crucible at Camp Pendleton, California was renamed last week in honor of a Marine Corporal who lost his life in Afghanistan in 2010. 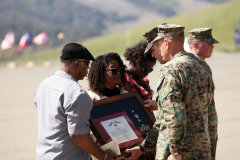 In a ceremony last Thursday, May 19, the obstacle in Camp Pendleton's Crucible that deals with improvised explosive devices was renamed in honor of Corporal Larry D. Harris Jr., who was posthumously awarded the Silver Star in 2011 for saving the life of a fellow Marine. 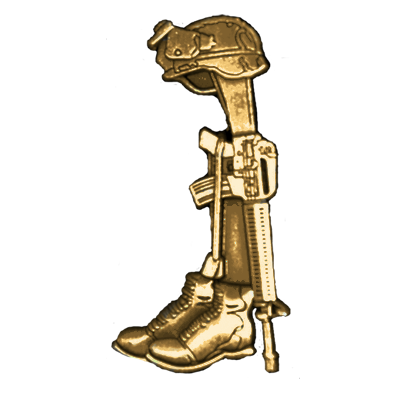 After his squad's machine gunner was shot in the leg July 1, 2010, Harris and fellow Marines left a covered position to reach the machine gunner and return him to safety despite being under heavy fire. Upon reaching the machine gunner, Harris picked him up and began carrying him toward an evacuation site. En route to the evacuation site, Harris stepped on an IED and was mortally wounded. The machine gunner survived. Navy Corpsman Peter Gould, who sustained serious wounds to his face and neck while helping Harris carry the machine gunner to safety, also received a Silver Star in 2011. *Image info: Lieutenant Colonel Fridrik Fridriksson and Sergeant Major Scott Samuels present the Silver Star to Larry Harris' parents, Lora and Bruce Merriwether, during a ceremony at Camp Pendleton, California, February 4, 2011. (Photo by Corporal Paul Basciano/released). 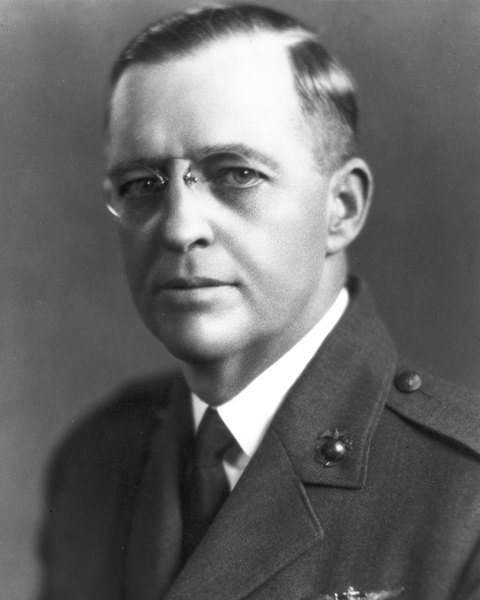 One hundred and four years ago this week, on May 22, 1912, First Lieutenant Alfred A. Cunningham became the first Marine officer to be assigned to "duty in connection with aviation" by Major General Commandant William P. Biddle after reporting for aviation training at the Naval Aviation Camp at Annapolis, Maryland. This marked the official beginning of the Marine aviation program. Twenty-eight years ago this week, on May 23, 1988 the V-22 Osprey, the world's first production tilt-rotor aircraft, made its debut at Bell Helicopter Textron's Arlington, Texas, facility. 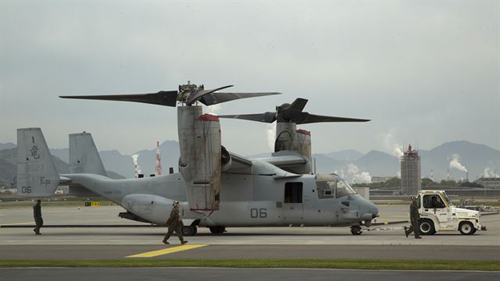 More than 1,000 representatives from the military, the aviation industry, and the media gathered to hear various speakers, including then-Commandant of the Marine Corps, General Alfred Gray, praise the versatility of the aircraft. 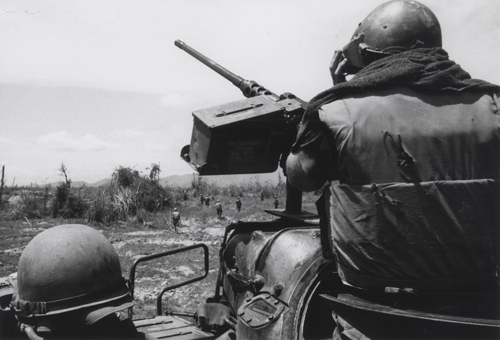 *Image info: T ankers with the 1st Marine Division man .50 caliber machine guns and 90mm cannons as they sweep through the ‘Dodge City’ area in the heart of the ‘Rice Triangle,’ 12 miles southwest of Da Nang during the early stages of Operation Pipestone Canyon. (USMC photo by Staff Sergeant A. J. Sharp).